It’s a full evening of SWING, RAT ROD, ROCKABILLY and BURLESQUE! Louis Prima Jr. is performing a celebration tribute concert in honor of his father, Louis Prima’s 100th Birthday. 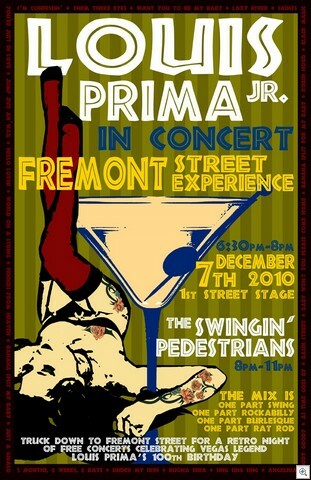 Tuesday, December 7 6:30 to 8pm on the First Street Stage at Fremont Street Experience. The Swingin’ Pedestrians follow with 3 sets from 8 to 11pm. Don’t know about Louis Prima? Of all the musical giants of the past seven decades, specifically since the days of the big swing bands and Dixieland jazz, there is one who stands out amongst them all as the greatest contributor towards modern music and the course it eventually took. His name is Louis Prima and it all started when he took off at the once-famed 52nd Street in New York City. Thus, a whole new era of music began, with Louis coining such expressions as “swing” and other “hep” sayings like “solid jack,” “crazy man,” and many more. Later, it was decided to name Benny Goodman the King of Swing, but only as a result of a big hit on the song “Sing Sing Sing,” written by Louis Prima – so what does that tell you? THERE’S PLENTY MORE READING ON THE LOUIS PRIMA WEBSITE. Louis Prima’s Vegas Years are covered well in the Wikipedia article about him. The popularity of the big-band sound started to wane, and Prima began losing money, just as he needed it to support the pregnant Smith. Prima found work with Smith in small venues all over the East Coast. Eventually he called up his friend Bill Miller, who was then entertainment director of The Sahara nightclub and casino in Las Vegas, and asked for a job. The main stage at the hotel was booked for months to come, but Miller had an opening on the small stage in the lounge. His friend Cab Calloway warned him against the cramped Sahara lounge, and Vegas lounges in general were considered the domain of struggling newcomers and faded has-beens, but the financial pressure was too great for Prima to turn the gig down. Prima telephoned legendary New Orleans saxophonist Sam Butera and instructed him to pick up a few musicians and go to Las Vegas in time for Prima’s debut. Prima acknowledged his new musicians for the opening-night crowd, and spontaneously asked Butera what the name of the band was. Butera ad-libbed, “The Witnesses!” From then on, Sam Butera and the Witnesses backed Prima and Smith on stage and records. The initial Sahara gig was a resounding success, with Prima and Smith packing the lounge with every performance. They were soon promoted into the main showroom, and they quickly became one of the biggest acts in Vegas. Prima and Smith worked hard throughout the 1950s, performing multiple shows a night and finishing at 6 a.m. Their efforts were rewarded with a resurgence in their popularity, and they were at least partly responsible for making the lounge at The Sahara a hotspot. On stage, Prima insisted on Smith adopting a humorless, poker-faced character that would play straight to Prima’s zany ad libs. Smith actually had a fine sense of comedy that is often audible on the team’s recordings; no matter how much the incorrigible Prima tried to disrupt her vocals, Smith would often come back with a funny remark of her own. Louis Prima and Keely Smith were very much the model for Sonny & Cher: the exuberant Italian musician and the serious, exotic female singer, Smith and Cher both being of Cherokee descent (although Cher’s heritage is primarily Armenian). Similarly, echoes of the stage banter between Prima and Butera would be heard years later in the early performances of the E Street Band and the interplay between Bruce Springsteen and Clarence Clemons. In 1959, Prima and Smith won the Grammy Award for Best Performance by a Vocal Group or Chorus for “That Old Black Magic”. In 1956 the Prima ensemble performed at the Sahara Hotel and Casino to record tracks for the album The Wildest!. It was an attempt by Capitol Records to capture the essence of the Vegas act. Over the next nine years, Prima and Smith raised two children, while he made scores of records, owned racehorses, appeared on television, and even opened a golf course. They outgrew the lounge and were promoted to the big room. They appeared in a few quickie musical films, including Senior Prom and Hey Boy! Hey Girl! Prima co-produced the feature Twist All Night, in which his band also appeared. During this whirlwind of activity, according to Smith, the couple drifted farther and farther apart. One night, he refused to conduct for one of Smith’s performances, delegating to Butera instead. A few days later they were in court, petitioning for divorce. It’s one of my mother’s all time favorite songs!